Winter holidays provide a lot of entertaining opportunities, as well as plain, old family fun. 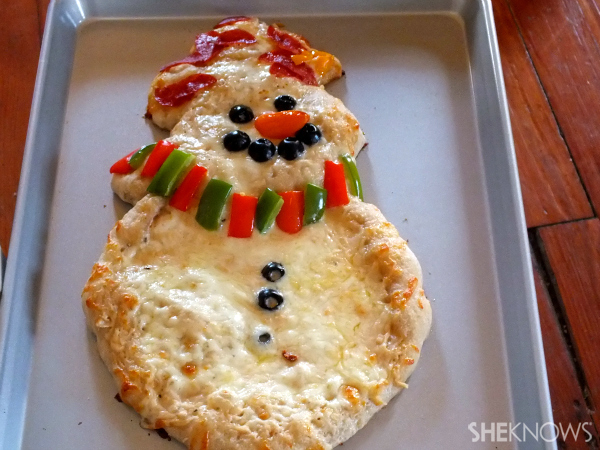 Pizza always gets a warm welcome, and doubly so, when it comes to the table looking like a snowman. This is an easy dinner that you can put together very quickly by using pizza dough that is ready to roll and bake. Many grocery stores carry it in the refrigerated section. If yours doesn’t, the local pizza place will usually sell you some of their unbaked dough. Preheat the oven to 425 degrees F or as the instructions on the package direct. Make one big snowman or a couple of individual ones, whichever you prefer. 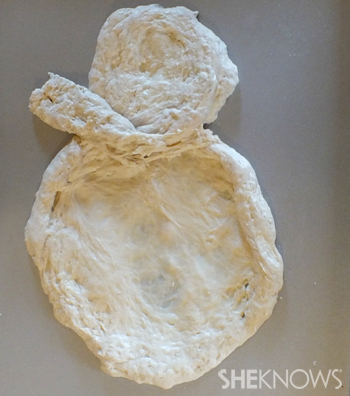 To form the shape, divide the dough into two or three parts. Make each part a little smaller than the one before it — just like a real snowman. Stretch or roll out the dough until it is as thin as you like. Lightly spray a baking sheet with non-stick coating and lay the largest circle down. Add the smaller one next — slightly overlapping the large piece. If you are adding a third circle, you’ll attach it in the same way. 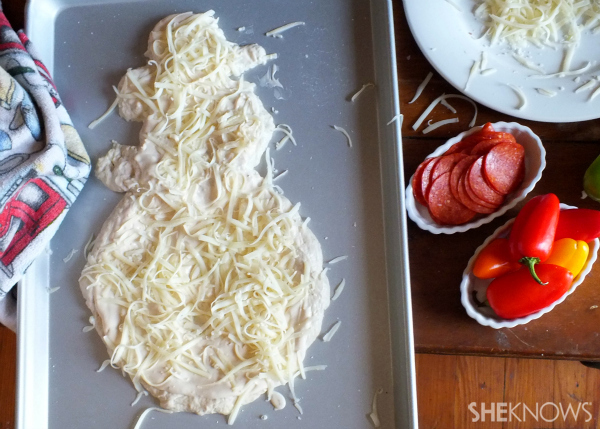 Shape leftover dough into a scarf, hat or any other accessory that your snowman might need. 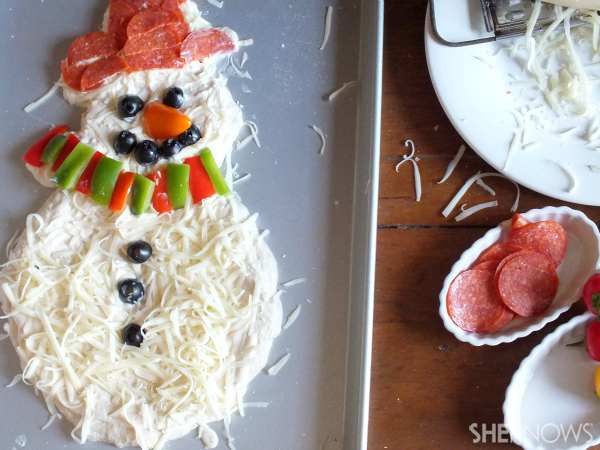 Use your sauce, cheese and toppings to give your snowman life! 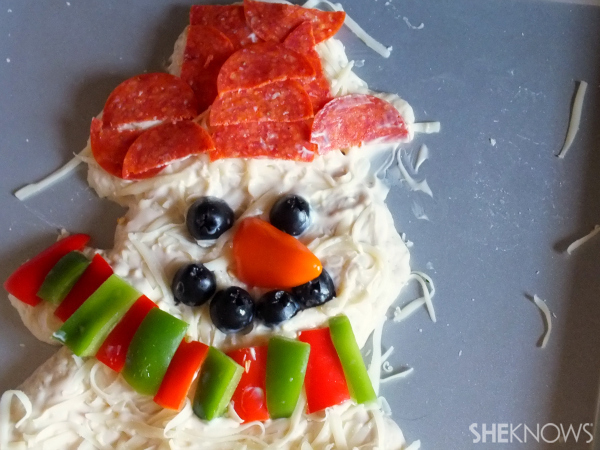 A white sauce topped with mozzarella cheese works best to keep your snowman looking “snowy.” Use olives as eyes, pepperoni for the hat and chopped veggies to decorate the scarf. 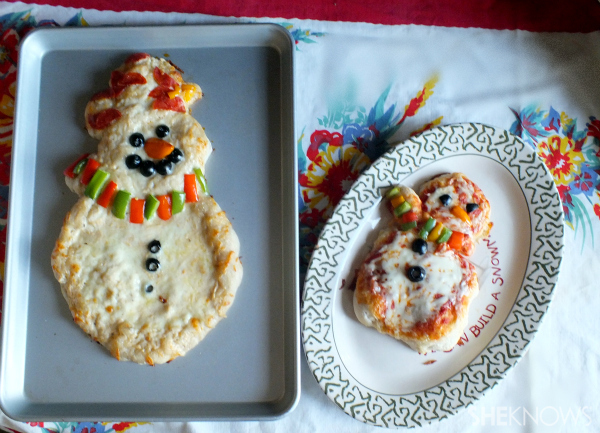 Again, imagination is key to a truly brilliant snowman pizza. Slide the pan into the preheated oven and bake for 12 to 15 minutes, or as directed in your recipe. When the pizza is done, remove it from the oven and let it cool for a few minutes — just long enough for the cheese to set. The pizza will change shape in the oven and the toppings will likely shift enough to change the look of the pizza. Just go with it!